The physics of High Volume Low Speed fans lend themselves well to manufacturing and production environments. 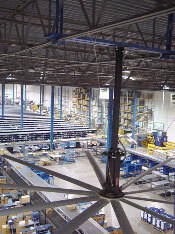 Year round, HVLS fans can provide superior ventilation capabilities. They continuously mix incoming fresh air with stale air reducing the total amount of ventilation required to achieve adequate air quality. The slow moving fan blades circulate massive quantities of air with a barely discernible and non-disruptive, but highly effective flow. As a result, airborne contaminants such as smoke are rapidly ventilated, but not at the cost of raising settled dust. As such, you can reduce the possibility of adverse effects that poor air quality can have on people, as well as machines. Manufacturing and production facilities with high ceilings face several changing environmental control challenges. These include adequate and safe ventilation of production areas, and cost-effective temperature control within all employee-designated areas, from work spaces to the cafeteria. Companies must also help protect investments in capital equipment which are often susceptible to heat and contaminant issues. Proper environmental control can prolong equipment life and reduce maintenance costs. Industrial fans provide air and gas movement that is absolutely necessary for most factories and other industrial sites. Industrial fans and blowers stir up the air in enclosed areas, replacing stale and contaminated air with fresh air. They can be used in many cooling and drying applications in many construction sites. Industrial fans are essential in some factory settings where they reduce high heat levels and prevent air stagnation when air conditioning is too expensive or not an option. Industrial fans also remove smoke and other odors in cooking and processing applications and regulate gaseous fumes in chemical industries and automotive shops. All benefits protect the health of workers and customers in your facility.